A first-rate combination of international talent performing a work of exquisite grace. Take the Australian Chamber Orchestra with its bank of fine musicians and priceless instruments led by the violin virtuoso Richard Tognetti, add extra musicians (some Australians and some international guests who have performed or are currently members of pre-eminent Baroque ensembles in Europe) along with a first-rate tenor Evangelist (Nicholas Mulroy) and finally an excellent British choral group (the Choir of London) and you have something special indeed. Tognetti has now led the ACO for 27 years and the quality of playing and ensemble is testament to his devoted artistic direction. In typical ACO form for this repertoire we had some Baroque bows scattered throughout the ensemble and a mixture of original and modernised instruments with both steel and gut strings performing at old pitch (A 415 Hz) and tuning (Neidhart temperament). The continuo section was excellent with Neal Peres da Costa tirelessly contributing intelligence and great style along with respected Australian Baroque bassoonist Jane Gower and the satisfyingly articulate playing of Timo-Veikko Valve on cello. The contribution of timpani throughout was understated though the natural horns at the opening of Part IV provided startling and wondrous music making. The Christmas Oratorio (Weihnachts-Oratorium, BWV 248 composed in 1734 for performance over Christmas 1734–35) comprises six cantata-like works called ‘Parts’ intended to be performed at intervals between Christmas Day and Epiphany. In this performance, we gratefully heard all six Parts, making up nearly three hours of music separated by a longer than usual interval for sustenance. Interspersed paraphrased poetry and the Gospel Narrative of the Nativity (Luke 2:1-21 and Matthew 2:1-12) are set as recitative, arias, choruses and chorales. The work is rich in symbolism and irony that Bach (and the Lutheran Church) clearly savoured: naïve infancy versus political malice, rest in the face of fear, innocence and powerlessness as opposed to earthly dominion, and ultimately gentleness and love purchased at the cost of pain, bloodshed and sacrifice. There are beautiful and moving moments in this work such as the well-known, tender Sinfonia Pastorale in Part II depicting shepherds in the fields watching over their flocks before being interrupted by an angel advising them of the birth of the Christ Child, imploring them to journey to witness the miracle. Of the singers, first and foremost I must mention tenor Nicholas Mulroy, who last performed the work here in 2013 with the ACO, as Evangelist par excellence. Singing with the choir as well as solo almost entirely from memory, his rhetorical skills were first rate. He leaves this tour to sing for Jordi Savall in a tour of Handel’s Messiah in Europe. The excellent Choir of London comprises 19 singers, almost all of whom, astoundingly, took solo roles in the work. They stood and delivered, voice parts interspersed with one another, with splendour. This is no precious choral sound but full-bodied while elegant, dramatic and highly expressive, where each and every singer is one amongst equals. Here was rock-solid rapport, balance, tuning and consistent vocal quality, crisp consonants and equal vowels, a feature of the best British choirs. German pronunciation could only have been bettered by the best native speakers. The openings of Part IV Fallt mit Danken as well as Ehre sei dir in Part V provided truly exuberant singing. The opening chorus Jauchzet, frohlocket in a blaze of D Major took time to establish its pulse, which was to prove a consistent problem with the performance. Tognetti often chose to dangerously conduct a slow one in the bar sometimes directing this sizable ensemble only by shaping phrases that led to some worrisome ensemble slippage here and there. Demonstrating that he is a far superior violinist than conductor, the times he played obbligato violin solo using a Baroque bow revealed how much more at home and certain he was. Another problem was the acoustic of the vast Hamer Hall at Arts Centre Melbourne; how much better it would have sounded in Elisabeth Murdoch Hall. While the excellent pair of valveless horns and trio of trumpets were vividly present, the quartet of soft oboists (also playing oboe d’amore and oboe da caccia) and pair of transverse flutes were squandered on side rises facing inwards. The Elisabeth Murdoch Hall would have also provided a much more satisfying bloom on the choral and vocal sound. In terms of soloists there was good to great singing, the best being saved to last. Highlights were florid passages from tenor Jeremy Budd in Frohe Hirten (Part II) and the velvety softness of mezzo soprano Fiona Campbell’s Marian reflection in Schließe, mein Herz (Part III). The full and expressive singing of soprano Anna Dennis in Flößt, mein Heiland (Part IV) with offstage oboes and soprani was a joy though the theological meaning of the aria was perhaps obscured. But what a discovery alto Lotte Betts-Dean is, providing a glorious, highly sensitive interpretation of Mein Liebster herrschet schon (Part V). And yet, all of this glory was outshone by young tenor Gwilym Bowen’s recitative and final aria in Part VI Nun mögt ihr stolzen Feinde schrecken. Vibrant, expressive, agile and dramatic, this crowned an astounding array of vocal quality throughout the performance. In the printed program the “Choir of London” is distinguished from “Musicians on Stage”. That Tognetti humbly shook hands with all the performers to sustained and enthusiastic applause was evidence that all here were indeed equal. 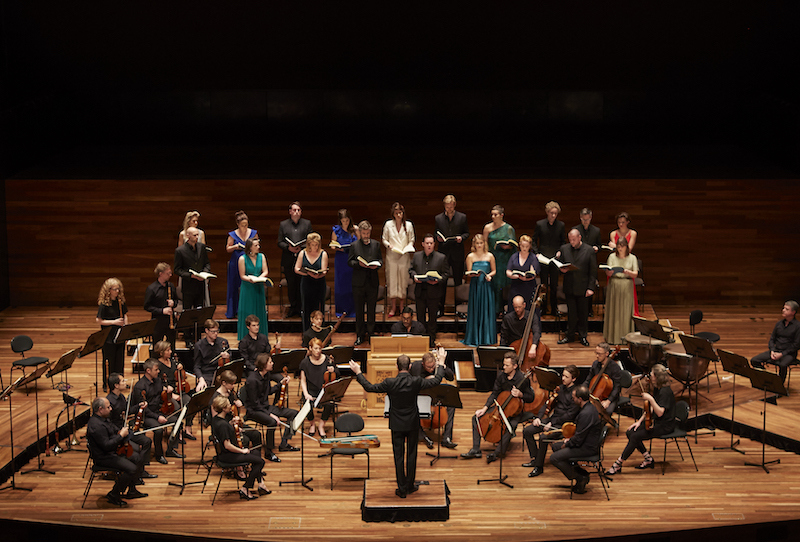 The Australian Chamber Orchestra performs Bach’s Christmas Oratorio in Brisbane on December 6, Canberra on December 8, and at the Sydney Opera House on December 10. Read Limelight‘s interview with Nicholas Mulroy here.